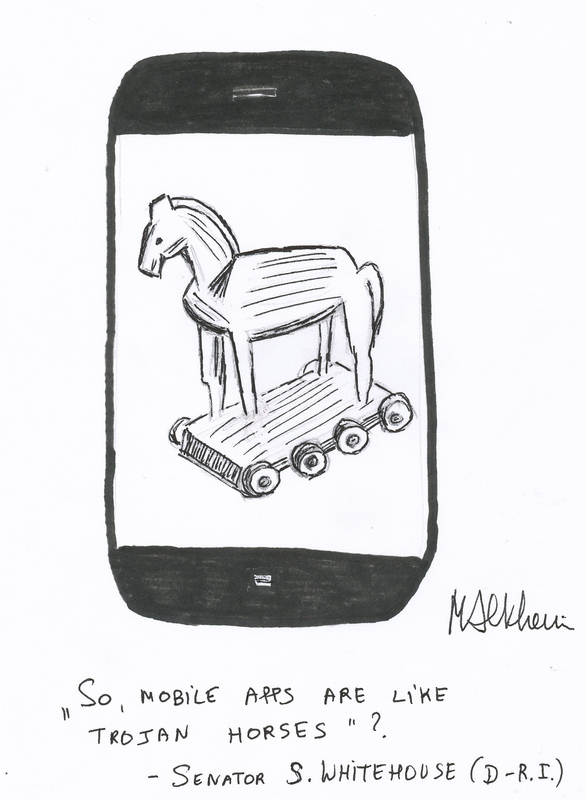 During the Senate Judiciary Committee hearing on mobile privacy, held on May 10, Senator Whitehouse asked Rich (FTC) and Weinstein (DOJ) if mobile apps were like “Trojan Horses” of consumer info. According to Wikipedia,The Trojan Horse is a tale from antiquity. 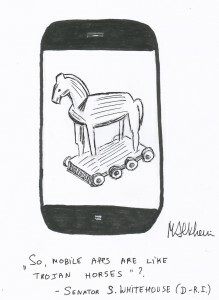 From the context of the hearing, it would seem that Senator Whitehouse was referring to the original, albeit metaphorical meaning of “Trojan Horse”: the mostly free mobile apps are waiting in the app store to be downloaded by smartphone owners on their mobile phone; once the app is “inside” the phone, it “opens all the information gates” for the app developers, Apple, Google, advertisers, ad networks, the entire marketing ecosystem and a garden variety of hackers and stalkers. The consensus during the hearing seemed to be that it is. At least within the US. Justin Brookman, director Consumer Privacy for the Center of Democracy and Technology, gave a comprehensive summary of relevant laws and an analysis of their application to today’s location- enabled mobile devices. In other words: Except in certain sectors, like healthcare and finance, and except in a couple of states like Massachusetts and California, the personal data of smartphone (and general internet) users can legally be shared with anyone, without the data subject’s consent. But the mobile world is global and flat, and does not distinguish between smartphone (or internet) users, depending on their geographical location: it tracks them all the same. Except that outside the U.S., many countries have strict data protection rules that make mobile (and general internet) tracking illegal, unless a list of conditions are met. The European Data Protection Laws, and the national data protection laws of the EU member states, for example, require, among many others, notice and informed consent for tracking of all personal data, and explicit consent for tracking of sensitive data, relating to health, religious beliefs, political opinions, sexual orientation, race, and membership of organizations. The current overhaul of the 16 year old EU Directive 95/46EC has exactly this global world in mind. Apple is already under investigation by data protection officials in Germany, France, Italy and Switzerland for possible breach of their national data protection laws. Last year, Mexico joined the ranks of more than 50 countries that have enacted global data privacy laws by enacting a “Federal Law on the Protection of Personal Data Held by Private Parties” that for a large part copies the EU model. More recently, India issued final regulations implementing parts of the Information Technology (Amendment) Act, 2008. These strict privacy rules also take after the EU data protection model and the penalties for non-compliance include imprisonment and fines. Global companies like Apple and Google should take into account that an increasing number of their worldwide business partners’ and customers’ personal data are covered by national data protection laws, even though the personal data of their own poor fellow countrymen are not.